Imogen Foxy Locks: Nubar Baby Blue - Perfect Chanel RIVA Dupe! Nubar Baby Blue - Perfect Chanel RIVA Dupe! Although pastels aren't usually Winter colours, this year is different. Baby blue is the must have colour this Winter! Many great brands have brought out there own versions. 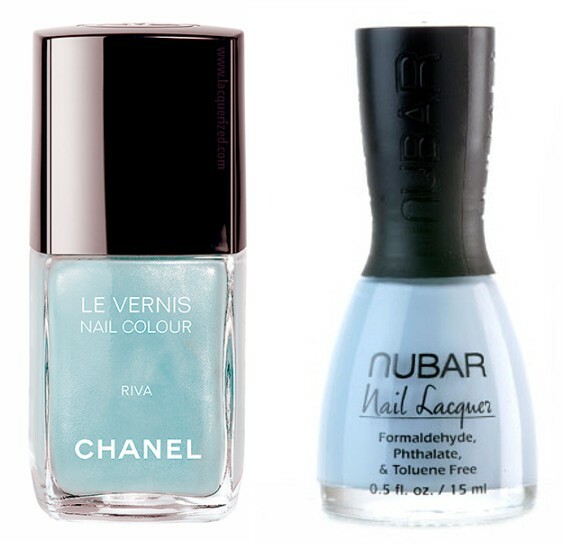 Of course Chanel has the most expensive (Riva) but if you cannot justify spending £22 on a nail polish then i have the answer....Nubar's Baby Blue! This icy pale 'barely there' blue is beautiful, i love pastels and this is one of the prettiest. The application is perfect after two coats. At just £8 it's a must have shade which is perfect for all seasons! Essa cor é linda! Aqui no Brasil, começou agora essa moda de tons pastéis (que acho lindo e fofo), mas aqui os preços dos esmaltes são muito mais acessíveis! Ficam em torno dos £1,30!!! This one has been on my wish list for a long time. It looks lovely on you & I think it's perfect for winter with your long sleeved, cozy gray sweater! Very Whimsical!! Pairing it with a nice subtle sparkle top coat would be fun! I love icy minty nail colours... gorgeous shade! I have this and it's one of my favourite shades ever. I'd much rather have this than the Chanel to be honest! Such a gorgeous colour! I seriously wish my nails were as gorgeous as yours to be able to flaunt such lovely nail varnish! Sorry to ask, as you've probably been asked this a million times! But what camera do you use? I really love this color, but i'm a portuguese girl and unfortunately we don't have this brand in Portugal :(. I absolutely love it! Havent really seen a nail polish in this colour before so thanks for drawing my attention! Love love love. Please check out my shopping extravganza/gift guide blog & if you're a fan, follow moi! I own Riva - gifted thank god, and the consistency and application is terrible. It's so streaky and it takes ages for one coat to try and needs at least 3 coats to show the colour nicely. Having said that, it's a great shade of blu-tack blue, but definitely wouldn't recommend spending that amount of money on it! Look forward to reading your new posts!